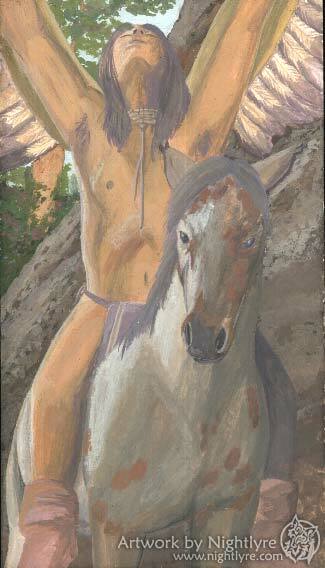 This is a painting I did for my mother, who is very interested in Native American artwork and kachinas. 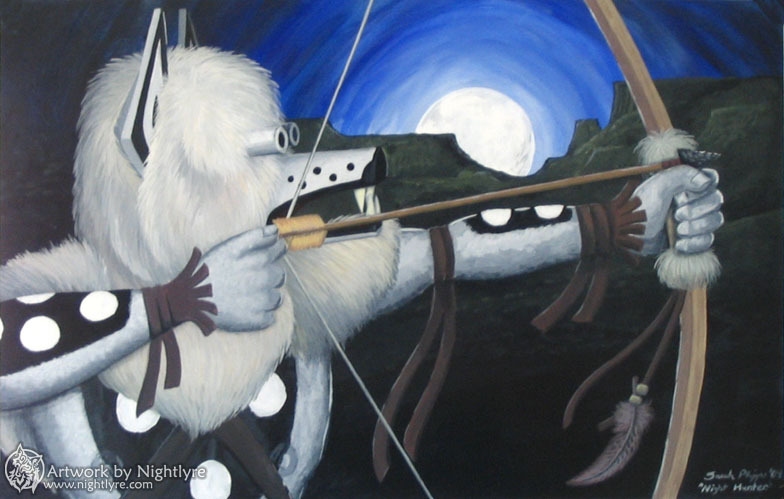 The painting, called "Night Hunter", is of a wolf kachina drawing a bow. I seldom work with acrylics, but I am very pleased with how this turned out. 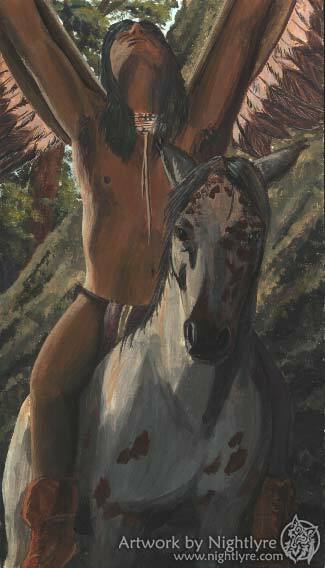 The painting is fairly large too, 22" by 15". 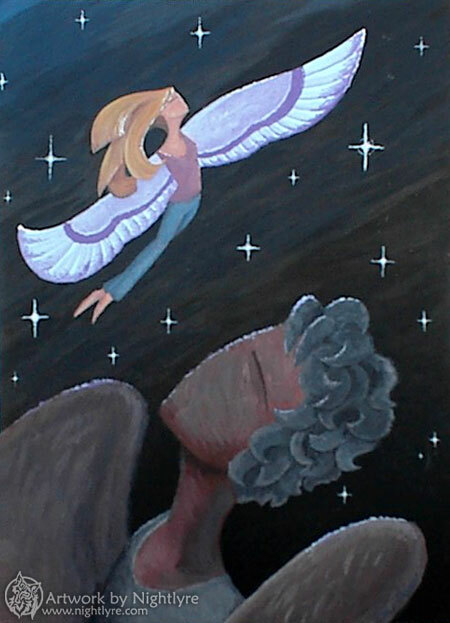 This was inspired by part of the lyrics to a beautiful Wallflowers song called "Babybird": "When all my colors fade and my wings, they turn to leather, I'll know the reason why God let me get older, when all my days are through and I fly these hills no longer, I'll lay beneath the stars and watch you flying over." It's done in acrylic, and is pretty abstract. Almost definitely the best picture of a human I've ever done. Mike was the lead guitarist for the Wallflowers for quite a while. 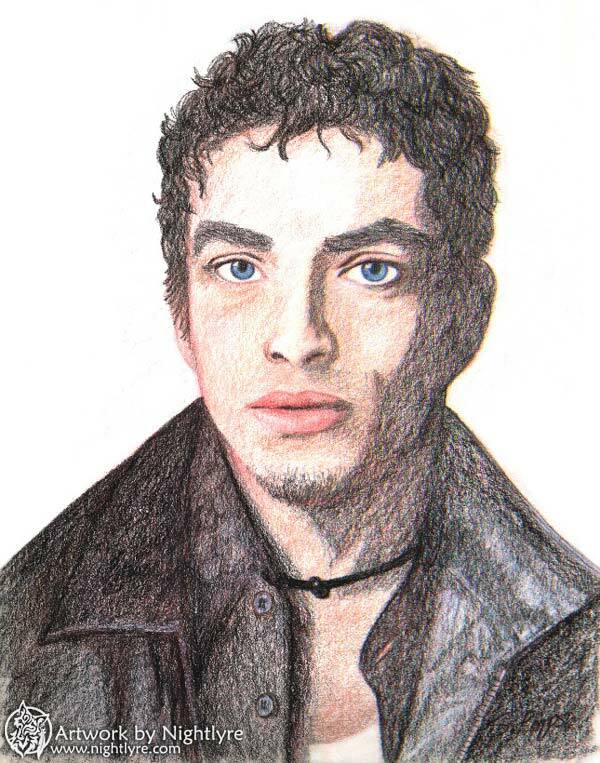 One of the best drawings of a human I've ever done, and certainly the best one in color. Jakob is the lead singer of the band, the Wallflowers. 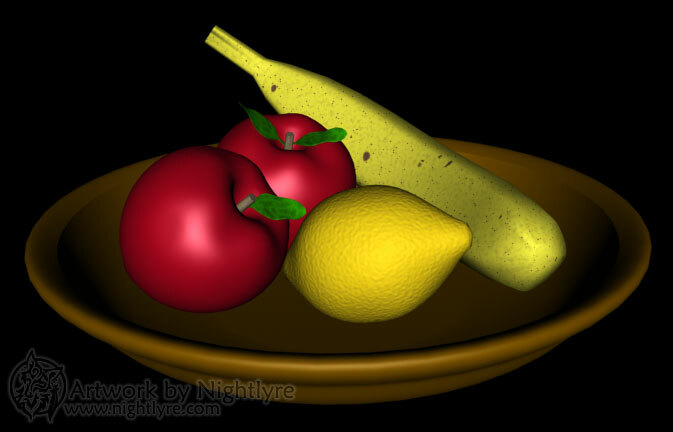 A fruit bowl, modeled in 3D Studio Max. 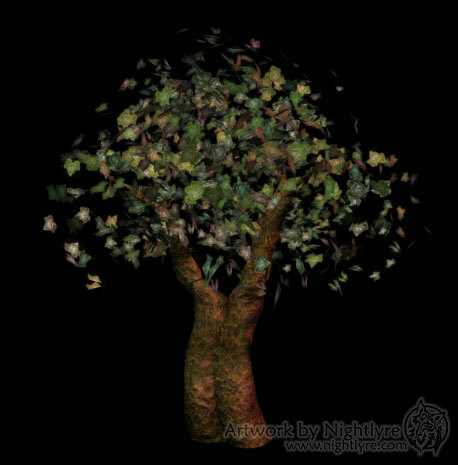 A tree, modeled in 3D Studio Max. 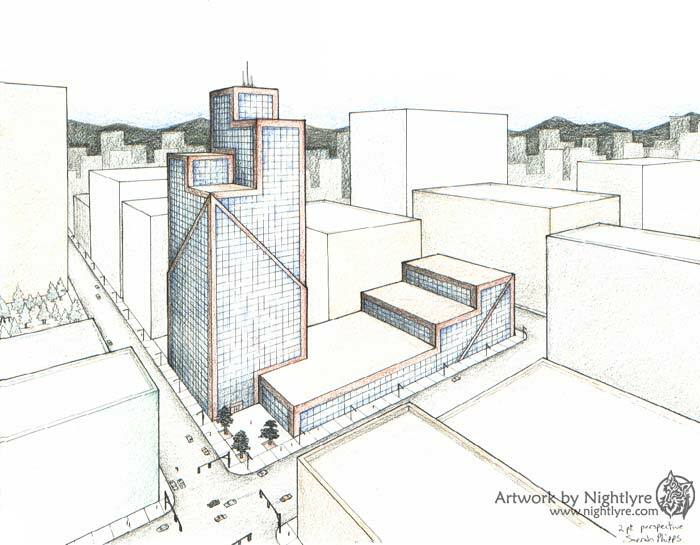 This is a two point perspective of a large building from a bird's eye point of view. This was an assignment for a college class, inked and shaded in colored pencil. 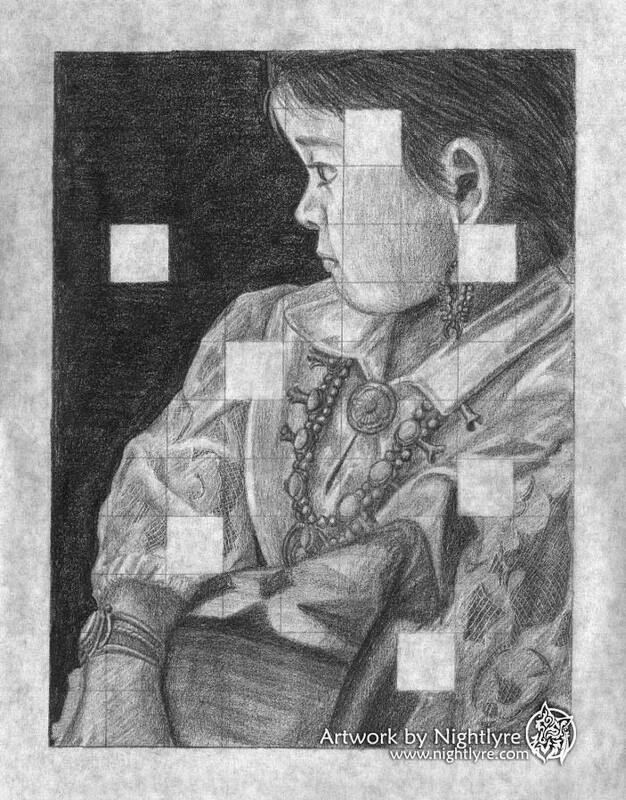 Drawn from a small photo using a grid; part of the assignment was to leave seven grid squares white in a way that worked compositionally. I'm very proud of how this one turned out. 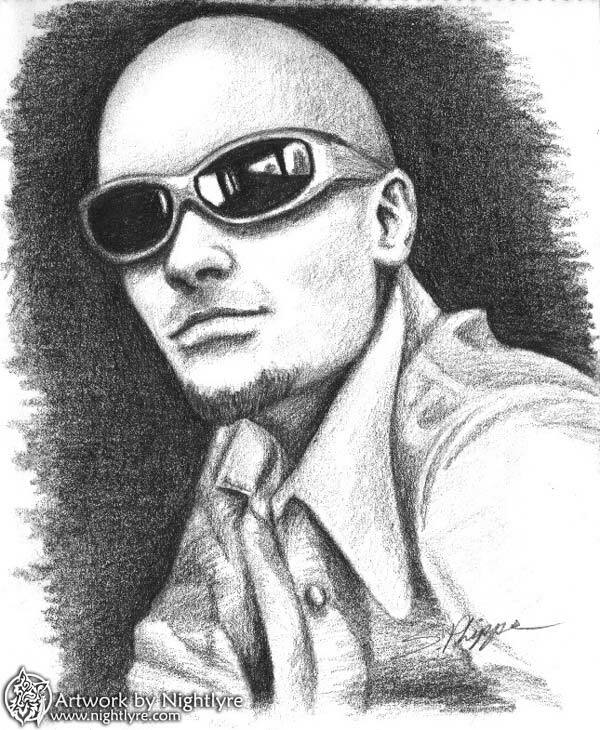 The drawing is fairly large (11" by 14"), done in graphite, for a drawing class in college. 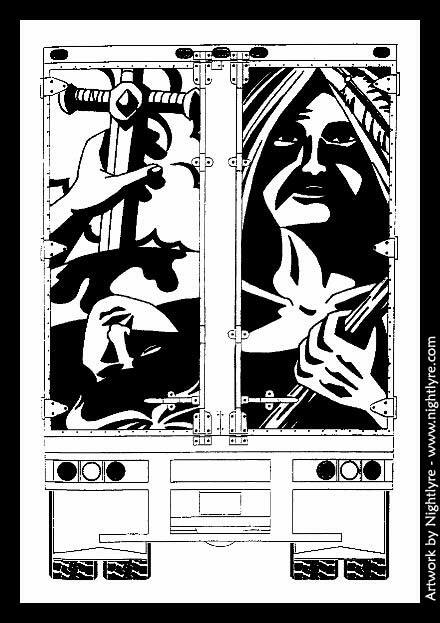 This was a design assignment, to use black and white only to create contrasting images, in the two spaces on the back of a semi truck. 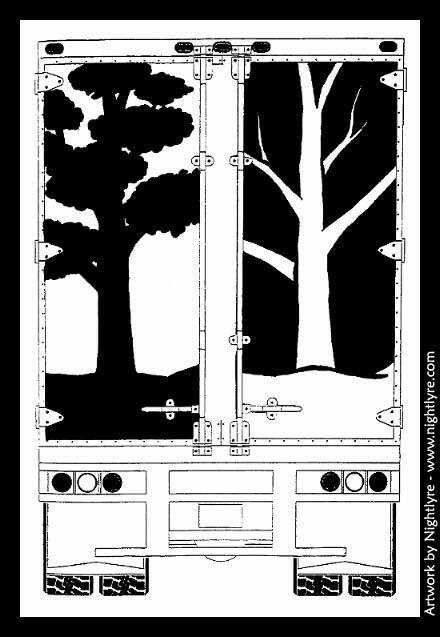 This was my first solution, trees in summer and winter, day and night. My second solution to the assignment above. 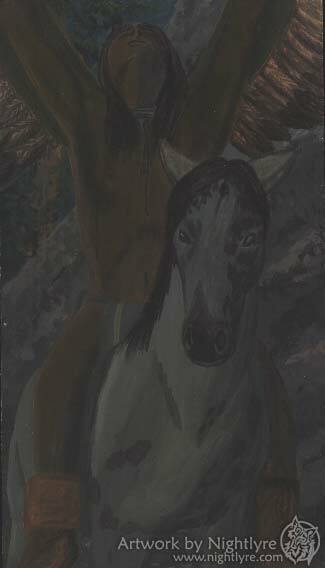 One side is a dying soldier on a battlefield, the other side, a Native American medicine man, a healer. The contrast spans life and death, youth and age, and two different cultures, maybe around the same time. 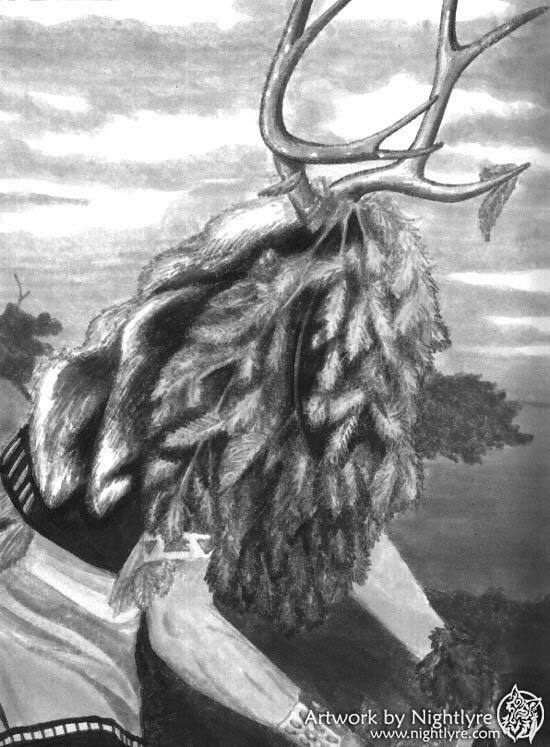 A grayscale marker study based on a photo of a Native American deer dancer, for a drawing class in college. 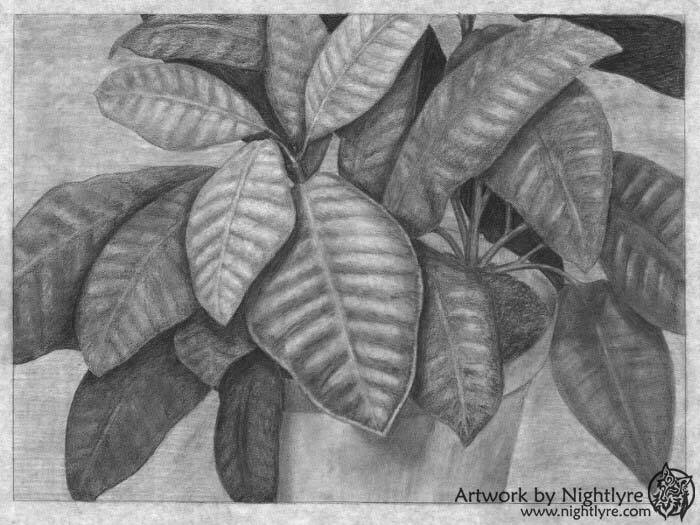 A graphite study of a plant, for a drawing class in college. It was a big image, too — it isn't easy to scan an 18" by 24" drawing on an 8 ½" by 12" scanner! 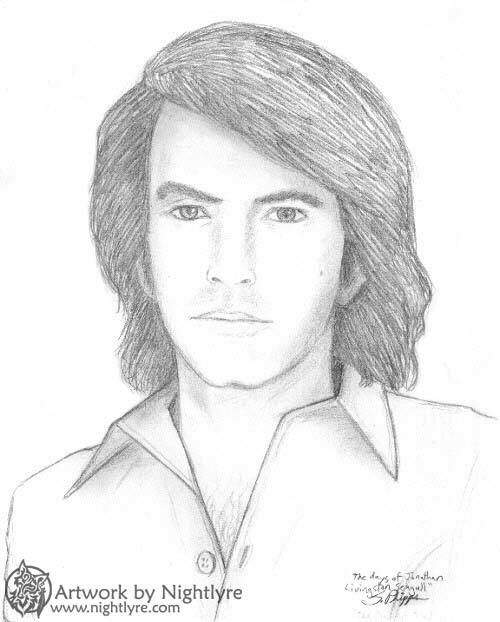 A drawing of a young Neil Diamond that I did for my mother. We are both pretty big fans of his. 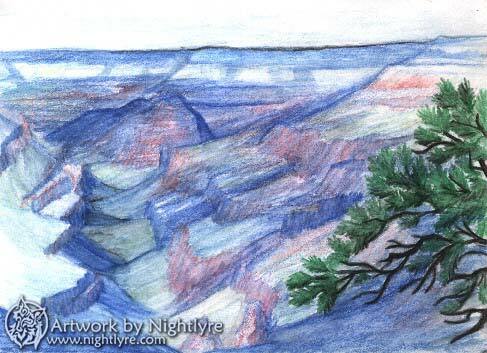 A drawing of the Grand Canyon, done in watercolor pencil. 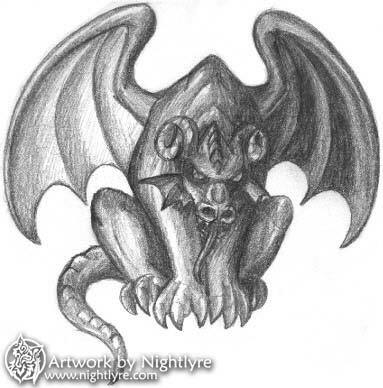 A graphite drawing of a gargoyle. 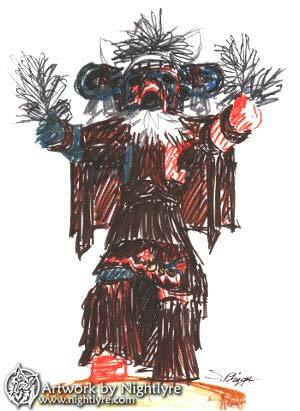 A marker sketch of one of my kachinas. My mother liked it so much that she got it framed — unfortunately in a frame too complex to take apart so I could get a better scan of it!